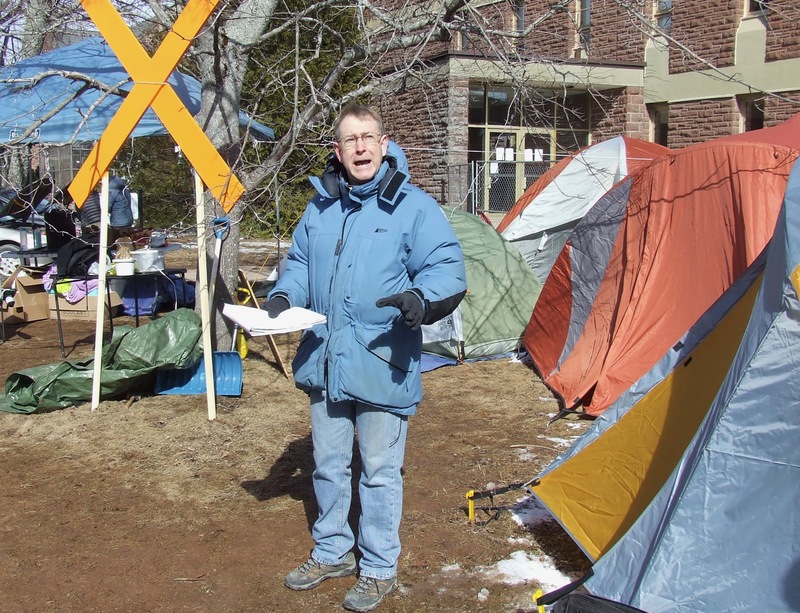 Students occupying the academic quadrangle at Mount Allison University received enthusiastic support today from several professors during a teach-in organized by the campus group Divest MTA. 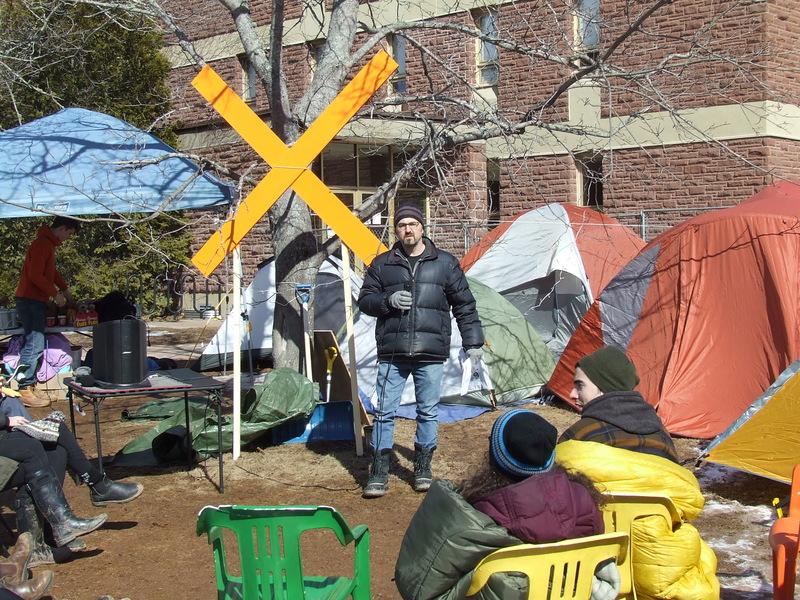 The group pitched tents and set up an indefinite occupation in the quad yesterday as part of its campaign to persuade the university to withdraw its endowment fund investments from the fossil fuel industry. 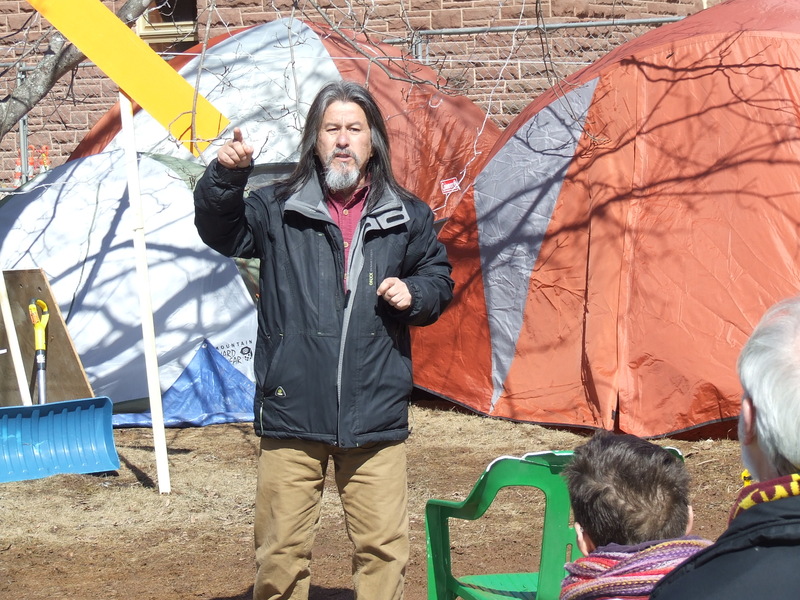 “The world we are living in now is a mess,” Modern Languages and Literature Professor Juan Carlos Martinez told the students during the teach-in. He added that they shouldn’t depend on their elders to change things. “We are part of the problem,” he said. Professor Martinez urged the students to keep speaking out in their struggle against the university’s investments in fossil fuel companies, a similar struggle he suggested, to the one being waged in Latin America against Canadian mining companies. “You are in university now. University is the perfect time to start to act critically,” Martinez said. Law pointed to a long string of budget surpluses at Mount Allison, yet he said administrators routinely cut spending on academic programs without consulting the rest of the university community. As for endowment funds, Law said the university’s endowment is approximately $150 million. “It’s one of the top three in Canada on a per-student basis,” he said adding that removing endowment fund investments from fossil fuel companies would mean redirecting a substantial amount of money. Dave Thomas, who teaches Politics and International Relations, said university administrators frequently justify continuing to invest in fossil fuels on the grounds that they have a responsibility to manage funds for the maximum benefit of the university, not to meet political objectives. Professor Thomas said that five years ago when he taught a course on socially responsible investing, he came across a research article that provided many different perspectives on what administrators call their “fiduciary responsibility.” He argued that term is actually controversial and highly contested. “The fact that it’s such a contested term is one of the reasons why you’ve seen universities taking positions on divestment,” he said adding that it’s an issue at universities in Canada while internationally many have already withdrawn their fossil fuel investments. “They weren’t all rounded up and thrown in jail for violating their fiduciary responsibility,” he said. Meantime, Alex Lepianka — one of the key organizers of Divest MTA — took issue with a statement the university’s director of marketing and communications made to CBC about the student occupation. Lepianka, who served as a student representative on the committee, said the new recommendations are a cover for the university’s refusal to disinvest from the fossil fuel industry. He added that the recommendations would make more investment information available, but would maintain business as usual. This entry was posted in Mount Allison University, New Brunswick government and tagged Alex Lepianka, Dave Thomas, Divest MTA, fiduciary responsibility, Juan Carlos Martinez, Robert Hiscock, Stephen Law, teach-in. Bookmark the permalink. At the moment there is a surplus of oil and natural gas because of Disruptive Innovation especially in North America where there is a huge glut. Better investments to be had than the fossil fuels industries at the moment. Though probably what MTA has is a conservative portfolio. Meaning having a diverse portfolio in a lot of different sectors not just fossil fuels. Without alternatives to hydrocarbons, all that “divesting” will do is ensure that others will get the profit instead of MtA. It will not affect DEMAND for hydrocarbons at all. What is really needed: alternative sources of energy. As an alternative to protests, I’d recommend that these students work on that. Nuclear fusion might be an option. Cheap solar could be interesting. But until then, hydrocarbons will fill a large percentage of our energy needs, and shifting around who profits from it achieves nothing at all in the grand scheme of things, though it might make us poorer. A specific project might be especially objectionable, but to “divest” from the entire sector achieves nothing. It’s not like demand will go down! Alternatives exist. The primary obstacle to implementing those sufficiently so as to minimize climate catastrophe is lack of political will, not lack of means. Fossil fuel companies have spent enormous amounts of money to ensure that business as usual continues. We are now only beginning to suffer the consequences of actions by these companies, the largest of which were fully cognizant as of long ago about the predictable impacts to climate and to the sustainability of civilizations. Hi Louis, I agree that alternative sources of energy are needed, and to that end Mt A could invest in the growing number of alternative energy companies instead of fossil fuel companies. With respect, your argument that others will profit more from fossil fuel investments if Mt A were to divest it’s investments ignores the moral issue at stake – publicly funded institutions should not be investing in companies that are largely responsible for the human contribution to global warming. If more and more institutions, governments, and individuals switch from fossil fuel to alternative energy investments then this will speed up the rate at which various affordable alternative energy sources will become available so that we can eventually cease using hydrocarbons for energy sooner. It is totally irresponsible for our provincial and federal governments to be still investing in and supporting the fossil fuel industry instead of investing in alternative energy research. I see the university’s primary responsibility towards endowment funds as being capital preservation and growth, and *not* speculative investments for the betterment of humanity, valid as that aim may otherwise be. I see speculative investments are the job of venture capital, not endowment fund managers.